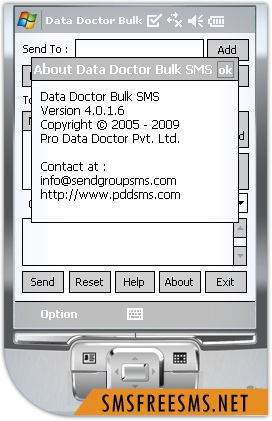 Pocket PC to Mobile SMS Software is complete solution to communicate with people by sending bulk text message. Pocket PC bulk text messaging software enables user to compose and send multiple text messages from pocket PC device. Now you can easily connect at any place and time using pocket PC to Mobile SMS software. Communicate with friends, clients and customers via pocket PC bulk SMS software! Pocket PC to Mobile bulk SMS software is proficient communication tool that allows you to communicate with friends, relatives, clients and consumers by broadcasting bulk text messages. Grow sales by advertising your services and products using bulk SMS software! Pocket PC bulk SMS software is comprehensive business marketing solution that easily sends bulk SMS to your customers to promote your products and increase sales. » Share information among the group of people using bulk SMS software! Bulk SMS software allows user to share information among the multiple people by sending bulk text messages. Pocket PC to mobile bulk SMS software easily sends bulk text messages related to job alert, product availability, product launch, business advertisement, share market information and many more. Allows user to send multiple text messages from pocket PC device. Easily save sent messages details that can be viewed by the users. Supports all pocket PC devices and Windows based mobile phones. No monthly subscription fees or setup charges to use the software. No internet connection is required to send the bulk numbers of text messages.